Fancy Bouillabaisse is full of shrimp, lobster, crab in a light flavorful healthy broth perfect for a great meal to serve company! A fish stew ready in less than 45 minutes! When researching this recipe I had to laugh at all the spellings that popped up. From “bouillabaise”. 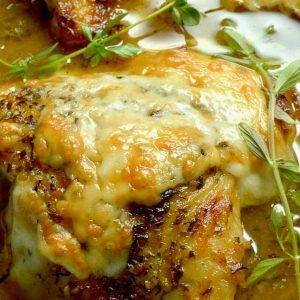 “boullabaise” which are pretty close, to the ones that really made me smile “boule base” to my personal favorites….. “booya base” and “booyabase.” No matter what you want to call it, it is delicious! Its a simple dish made of perfectly cooked succulent pieces of fish and shellfish that is served in a subtle flavorful broth thickened with healthy vegetables. 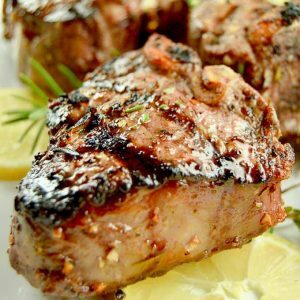 The recipe is most credited is originated from Marseille, France. A classic French recipe for provincial fish stew. Its also popular in the Mediterranean where they serve something similar called a fishermans stew. The one thing both places have in common is that its made with the freshest, shellfish and seafood that is available and not limited to specific kinds of fish. It makes it ideal for entertaining because you can use the fish that is readily available and thus its usually pretty economical. 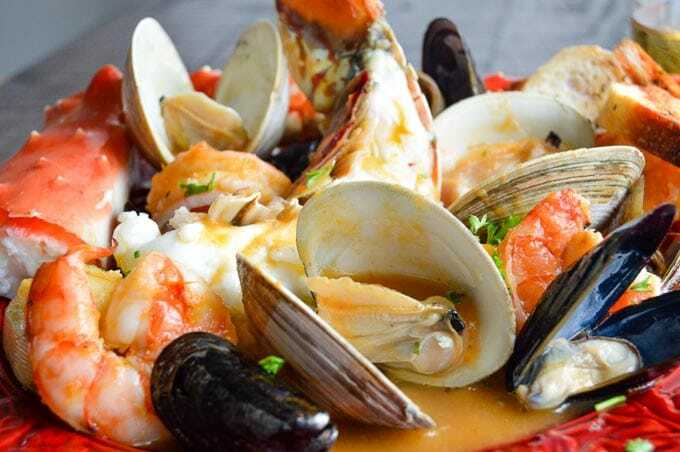 This seafood bouillabaisse is a go to for entertaining in our home because you can make it quickly and can customize it to whatever fish you like or are able to find that is fresh and available. 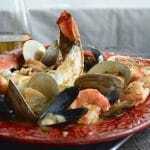 What fish/shellfish is in Bouillabaisse? The list for fish to use as you can see is endless. You can use pretty much anything as long as you are selecting things that you love and enjoy. We tend to stick to shellfish because its something we love. But on occasion I’ll add some fresh caught white fish cut into pieces. How do you make the fish stock for Seafood Bouillabaisse? You’ll start by making a very flavorful base. To start the broth I take the shells from the shrimp and make a simple fish stock. By adding onions, carrots and celery cut to small pieces then adding water along with the shrimp shells and bring it to a boil. It takes no more than 10 minutes to get all of the deep flavor from the shells into the broth and you are done. I highly suggest you don’t use salt or pepper into the broth at this point. It gives you the ability to taste and add the right amount of those seasonings once you have cooked the vegetables and fish. I like the control it gives by adding it at the last minute. Its easy to add more, but next to impossible to get rid of a salty taste if you over season it. Strain everything out and use the plain fish stock for the base of the fish stew. Can you use store-bought fish stock? Absolutely, but since it takes such little time to make it homemade and the fact I have the shrimp shells anyway I almost always make my own. If you aren’t using shrimp in your recipe you can make a vegetable broth as the base using the same ingredients and add a couple of garlic cloves. Once you have this fish stock you’ll layer on even more flavors with the additions of leeks, onions, tomatoes, carrots, tomatoes, tiny bite sized potatoes and the two ingredients that make bouillabaisse have such a full bodied depth. Fennel and pernot. Its up to you after the broth is made if you want to puree it or leave it thinner. I do it both ways. I tend to prefer a slightly thicker broth for the stew, but sometimes taking the time to puree it is time I don’t want to spend. Once the base is done all thats left to do is cook the shellfish and fish. How long to cook the shellfish and fish? These are just guidelines because the sizes you purchase will cause the time to vary. Over time Ive come to know how long to cook the fish. If I see something is done cooking I will pull it out of the boiling broth right away then finish cooking the other fishes. If you aren’t comfortable cook each fish in batches then remove from the pot. The steaming hot broth will rewarm the fish/shellfish very easily. Easy/Hard: The hardest part of this is cleaning the fish you use. The rest is super easy. If you puree the veggies after cooking them you can roughly chop all of them which makes prep super quick. Make Ahead: You can make the broth up to 3 days ahead, and even clean the fish and have them ready to just drop in the broth to cook early in the day. It makes it a great recipe for entertaining because you can just do the cooking of the fish at the last minute. Store the fish on ice under a dampened towel in the fridge until you are ready to use. Serve With: This goes great with a nice garlic bread and a garlic aioli spread. You use the bread to sop up all of the broth once you’ve finished the shellfish. Pairs with: a crisp white wine such as Riesling or a pinot gris. It also goes nicely with a sparkling wine, and on occasion Ive found a light rose that pairs well. Brined Roasted Turkey, perfect every time! 1 loaf Sourdough bread sliced. Into a stock pot, add olive oil and heat to medium high. Once hot, add leeks, onions, garlic, fennel and carrots. Saute until onions and fennel are translucent. Add tomatoes and saffron and stir for 5 minutes. Then add Pernod to deglaze the pan. (Scrape up bits from bottom of pan.) This will happen very quickly. Add stock(or water) bay leaves and potatoes to pot. Bring pot to simmer. Continue to cook until small potatoes and carrots are cooked and tender. Remove from heat. While the pot of veggies/broth is simmering, clean all shell fish and have on a plate ready to cook once broth is pureed. Put stock post of pureed broth back onto burner and heat to hot and bubbling temperature. Add potatoes back into pot. Once broth is hot, add clams first, and cook for 3-5 minutes. Then add mussels and cook for 3 more minutes. At this time add shrimp, lobster and crab and cook until shrimp and lobster halves are completely opaque. Serve with thick bread to use to sop up last of broth. You can make this broth ahead and then just reheat to hot and cook the shellfish at the time you wish to serve it. The broth can be made up to 3 days ahead. This recipe's calorie information was made using the exact ingredients/brands I purchased and calculated in My Fitness Pal. Please be aware that if you make it using different ingredients or substitute different brands the information will vary and plan accordingly if you are following strict dietary information. 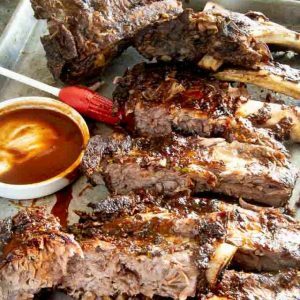 I made this recipe for my husband’s birthday and it was a big hit! He loves seafood and this dish was perfect. Thank you for another wonderful recipe. It is rare for me to click through from a pinterest link I just happen to come across… However this is the most enticing plate of food I have seen in a long old time! Ok I live in landlocked Hungary and this is a gorgeuous bowl of everything I love and cannot get my hands on! So I’ll not be making this in the near future but genuinely wish I could, wonderful sounding food! What a gorgeous meal! I love the combination of flavors, it sounds so up my alley! 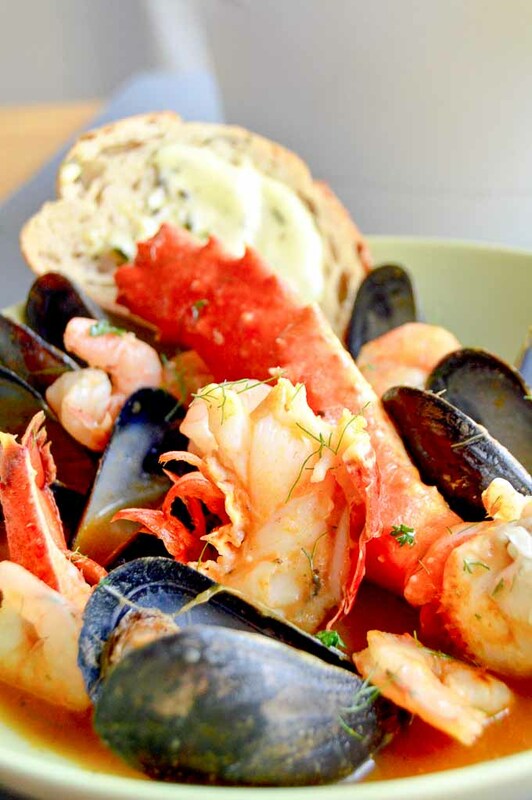 Seafood dishes always catch my attention… Especially if they’re fancy! Love this recipe, Michele! This broth is everything! Once I get through all the yummy seafood I need some crusty bread to sop up every last drop! I am DROOLING over here!! That looks like the perfect plate in my opinion!! LOVE!! Keep ’em coming!! This is making my mouth water just looking at the photos! Both my husband and I have been craving crab since the season is still going strong. Serving this with a side of linguine! Fancy is so right! This looks amazing! I’d be super impressed with this if someone served it to me. I’m putting it on my menu for next week! This looks so decadent and delicious and so perfect for entertaining! I love that you can make the broth ahead of time and finish the dish right before serving! Beautiful soup, oh my gosh I’m just salivating looking at the beautiful fresh shellfish. What a treat, I’d eat this at every opportunity! I’ve had it at a French restaurant with salmon and halibut and it was very good all shellfish sounds marvelous. I will definitely try this. Thank you. Can the lobster shells be used in the fish broth along with the shrimp shells? Wow… Breathtaking dish! I absolutely love the flavors you’ve incorporated! Hi Michele, this looks unbelievable delicious! I would love to try this, too! Thank you so much for sharing this recipe! Can I ask how you do your fish stock for this dish ?? Katie, Its super easy to make your own. Take 1/2 an onion cut into pieces, a carrot or two cut in a couple of pieces, a couple of stalks of celery and add it to a 4 cups of water in a stock pot. Peel the shrimp and dump the shells in to the pot with the vegetables. Bring it to a boil and let it simmer 15-20 minutes. Strain out the shells and veggies and you have a simple fish stock. I often throw shells in a zip lock back from peeling shrimp for other recipes and freeze them until I need them. You can freeze the stock in plastic containers for 4-6 weeks for use at a later date. ps…. I don’t put salt and pepper the stock, because I season the recipe to taste. What is Pernod? Any substitute? I studied in Marseille France where Bouillabaisse originated and was never a fan because of the kids of types of fish they added. 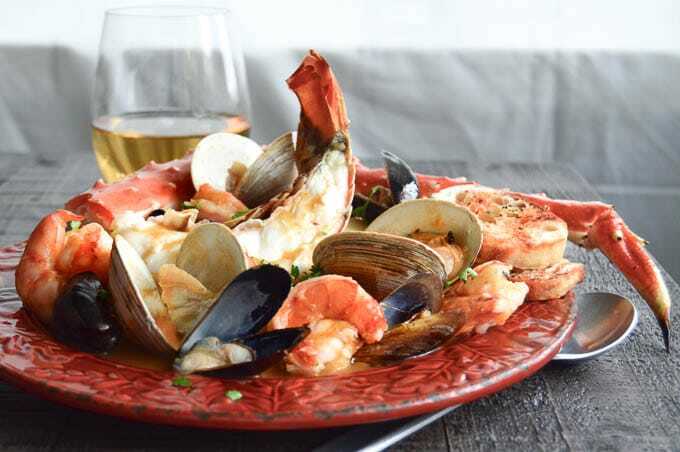 This looks fantastic with so much shellfish and I will definitely be trying this recipe out! This looks beyond amazing! What a great post! thanks for sharing! I’m one of those people who tends to lean toward the “hate” relationship with fennel, but I find if I get it at just the right time in the season, it has a sweetness to it that makes me want to put it in everything…for about 1 day. 🙂 I tend to enjoy meals like this though that have it puréed in! It adds such a layered flavor! Oh my gosh, you are speaking to me with this Bouillabaisse! Fresh fennel and saffron are such beautiful, fragrant flavors. They must bring such a wonderful aroma to the broth and complement that gorgeous seafood perfectly. If this dish doesn’t say true love, I don’t know what does; though, I might not be inclined to share! Haha. Both of those ingredients add such a depth of flavor to the dish. Its so subtle, but they add so much to the success of the dish… they do the fancy shellfish complete justice! That meal looks impressive and fancy! I have never cooked lobster or mussels before but you make it sound easy. I love your suggestions for wine pairings. We love to have a glass of wine with our meal so this will be perfect. I will have to save this recipe for later to try. What a fancy dish! I love that this is basically a shellfish soup but it’s also so much more. My hubby would absolutely love this. I’m going to put this into our rotation this week for date night! This sounds fantastic, and I never realized that it could be make in such a quick amount of time! I love the combo of seafood here, and you make this sound so fantastic! What a great meal! That plate of shellfish looks amazing! This looks divine! I have to admit – I’ve had bouillabaisse in Marseille, the birthplace of bouillabaisse, it cost about a billion dollars and I didn’t like it at all 🙁 It was super sad! The broth was muddy and the seafood got lost. But this looks much more refined, an opportunity for the seafood to really shine. L-O-V-E this! 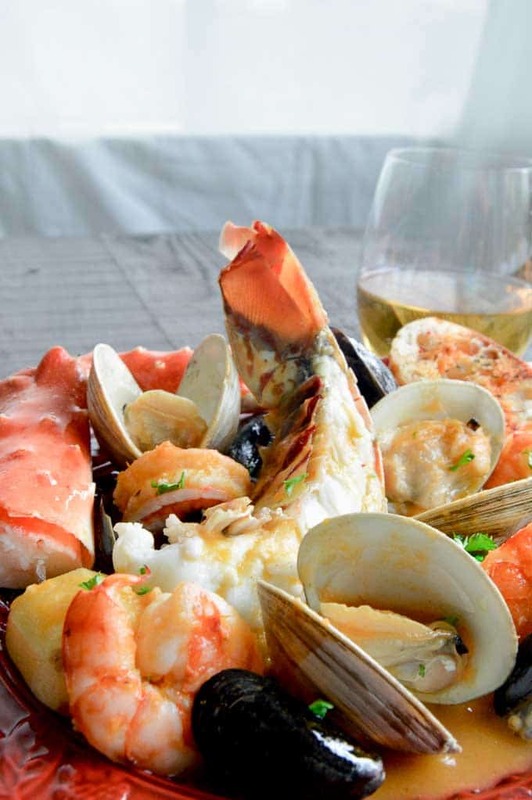 All that amazing seafood together in one bowl is exactly what I want to eat. I LOVE bouillabaisse! You are right!, It is a perfect date night dinner! I love bouillabaisse but have never tried making it at home. Definitely looking forward to trying this recipe! 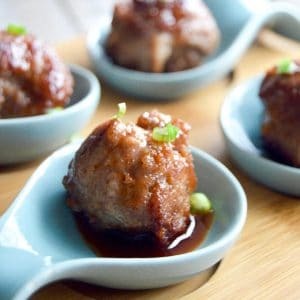 I want to make this for date night! 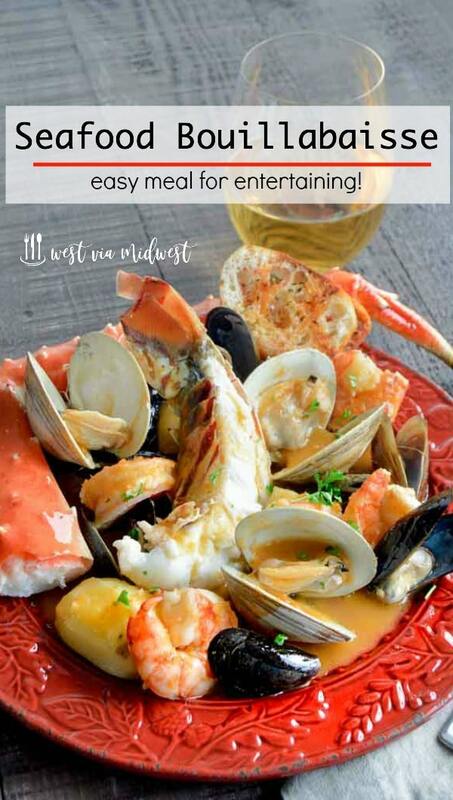 My husband loves seafood so this would be a perfect recipe to make for him! Food is definitely the way to my husbands heart! Hope he enjoys it Liz!